Good quiet location, well appointed apartment, comfortable bed. Breakfasts were very good. Staff was very friendly. The apartment was lovely, very clean and spacious. Nice bar and swimming pool outside, also very clean. Family run business and lovely people. Will definitely be going back. The rooms are big, nice and really clean, the staff is really nice! the apartment was recently refurbished so everything was new and to a very high standard. The place was cleaned meticulously every day. Lock in a great price for Blue Paradise Apart – rated 9.3 by recent guests! Located in Armutalan district, Blue Paradise Apart is just 1,150 feet from the beach. It offers apartments, and an outdoor pool on a sun terrace equipped with sun loungers. The spacious apartments of Blue Paradise are decorated with colorful furniture. Each apartment includes a bedroom, kitchen and a seating area. All apartments come with a TV, air conditioning and a balcony. The kitchens come equipped with a stove, refrigerator, electric kettle and kitchenware. Breakfast is also available at a surcharge on site. Marmaris city center is 1.9 mi from the property. Marmaris Marina is within 2.5 mi. Dalaman Airport is 59 mi away. There is an array of restaurants and shops in the surrounding area. When would you like to stay at Blue Paradise Apart? House Rules Blue Paradise Apart takes special requests – add in the next step! Debit card Blue Paradise Apart accepts these cards and reserves the right to temporarily hold an amount prior to arrival. Blue Paradise Apart accepts these cards and reserves the right to temporarily hold an amount prior to arrival. Please contact the property for check-in after 22:00. Alper and staff were very friendly and nothing was too much trouble. The room was very clean and plenty of room for the two of us. Stayed there for a month plenty of things going on around everything was on the doorstep. Enjoyed every minute of my stay there. 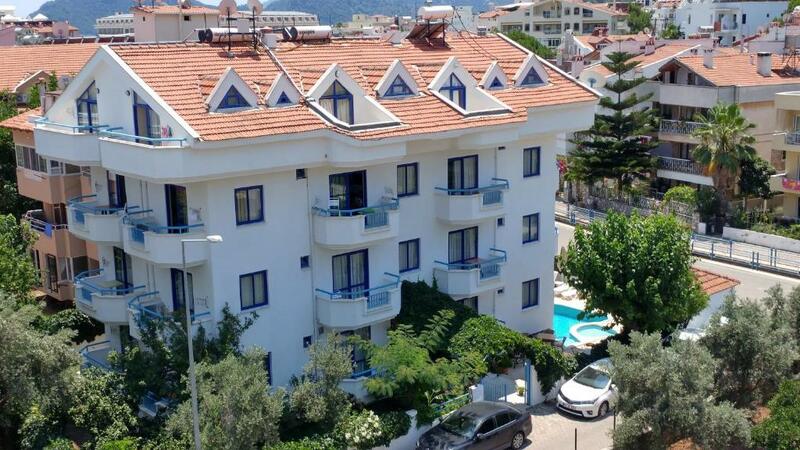 Would certainly recommend Blue Paradise Apartments for a lovely holiday. Very nice Staff. Spacy rooms. The host was not colaborating and not hospitable, the rooms were not so clean, the furniture was in bad shape unlike the photos in addition there was one A/C in the bedroom only.